Renamed 'Hal'. Premiering at Sundance. Man, thanks for the heads-up on this. I grew up with his films. Awesome talent. 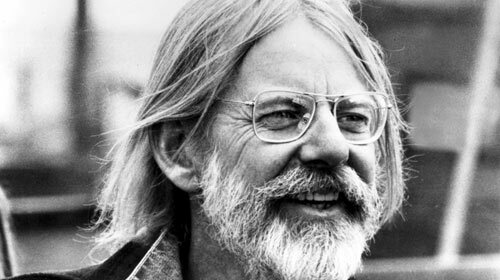 I first heard of Hal Ashby in early 2001, reading what was, at the time, one of the most fascinating books I've ever laid eyes on, "Easy Riders, Raging Bulls", thinking this dude is one of the most interesting characters in this Hollywood tale - - making movies and holing up in an editing bay floating on clouds of pot smoke. At the time I had seen zero films by Ashby, since then that number has only increased to four, although I own three of his best ones so all that needs to be done is inserting those discs into a BR-player and that number moves up to seven. Add to that the forthcoming release of The Landlord on BR and I'll have seen just about all his work, at least the ones that count. The seminal 70's movies. One thing the new documentary about the man sheds light on that I wasn't clear on was the reason why he was so highly lauded in the Hollywood community, by people like Warren Beatty, Jane Fonda, Towne. Norman Jewison has a very special place in his heart for Hal. Amy Scott's doc, "Hal", makes it clear - - this man was a pure soldier of cinema. Ashby lived for making movies, especially movies that said something, had a heart and exposed prejudice, hypocrisy, societal inequalities. A hippie filmmaker whose movies were actually good, not some spacey drugged out faux notion of peace and love. Amy Scott did a good job bringing us close to the man, especially considering the dearth of material she had to draw on. There aren't many available interviews with her subject, especially on video, so the doc mainly relies on testimonials from collaborators, although we're graced with letters (narrated by Ben Forester) and some audio recordings of the man himself. His short-lived 80's life isn't afforded much time, understandable for a doc that runs under 90min, but would have been interesting to know more about the cause of his blunders after striking a streak successes (in quality at least) like few filmmakers ever have. Otherwise, this thing is a real pleasure, emitting super chills in the montage moments of all his films. Dude did some fine work. Assumedly that's why there is so little information about his personal life...he had no personal life. His parents divorced at 6, his dad killed himself at 12, he had a daughter at 17, then he split to California and the rest is history. We get brief words for his daughter and a an ex-girlfriend or two, but that's the extent of the personal stuff. 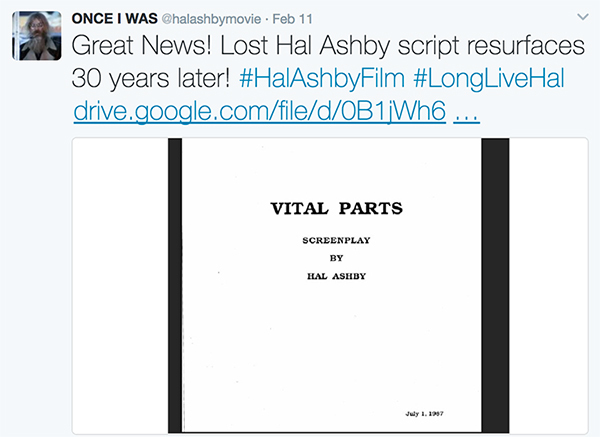 Hal Ashby breathed for cinema, lived for cinema. Clearly now I am itching to watch his movies, the three just standing there on my bookshelf (Being There, Harold & Maude, Coming Home), taunting me to play them. That will probably go down this weekend. Would also like to revisit the ones I've previously seen. Check this doc out whenever you can, if you love movies that is, which you do, because you are on Xixax. I wanna see this doc, is it streaming yet anywhere? not yet, think it just finished its theatrical run. saw in a 300-seat theater with only two other person in attendance. You have a ridiculously great cinematic few hours ahead of you seeing those three for the first time. Since I'm The Old Dude around here (who came of cinematic age in the '70s), I can tell you that seeing his films first-run back in the day was always such a moving, profound experience. Underrated--or at least too forgotten in the time since. I'm really looking forward to this doc as well. And I love that book, too... Might be time for a re-read.